there's a time attack event at adams motorsports park on april 7. any other s-chassis guys want to go? I added a lap vid for the Watkins Glen Lap also. I think i need a more aggressive brake pad...i left a lot on the table here, but my word is that a fun track! What brakes are you running? Hawk HPS. I'm contemplating running their autocross/track pad (HB178N.564). Still somewhat streetable and has a better bite with less brake fade than the HPS pads. They're noisier, and make more dust, but i guess that's the compromise for better performance. Oh Jesus man, you're not doing yourself any favors! HPS can fade on the street from a couple of highway stops. HP+ are better, but not by much. Do yourself a favor and get dedicated track pads if you're serious and swap them in. I used to run the HP+ pads, predominately for the track, but there was to and from the track driving as well. They were effective with Powerslot rotors and a 135 WHP KA24DE full out on Big Willow and Streets. They are certainly better than HPS, but I remain skeptical based on my own experience in 100's of track hours in my old endurance race car with a basic KA24DE. 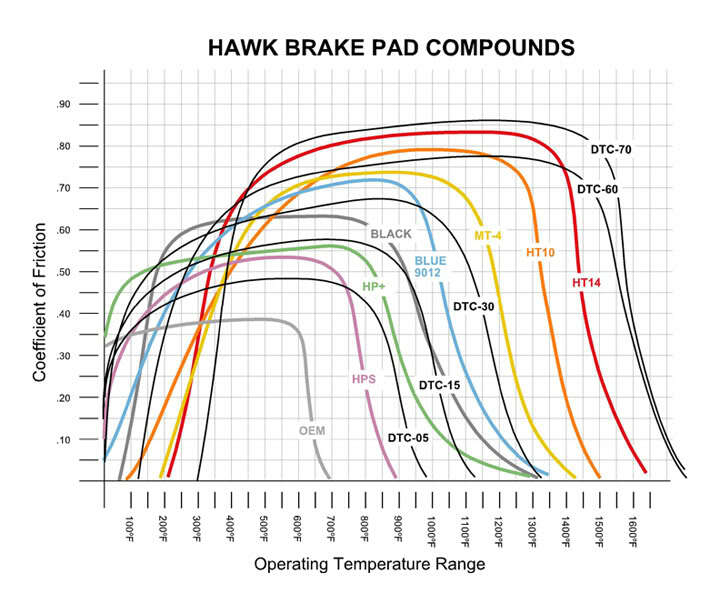 I used to get DTC-60/30 front/rear split on z32 brakes to suffer from poor pad transfer due to overheating and the car was only 2400lbs race weight. They wouldn't fade, just pad depositing and cause bad pulsation/judder. Once I ducted the front they were ok, but the rear dtc-30 would still get overworked and smear all over the rotor. HT-10 in the rear fixed that and helped balance the brakes better too. This all depends on skill level, track and level of commitment, obviously. Seeing that he has an LS swap, and how fast an LS13 can potentially be, HP+ are less than ideal if he wants deceleration performance/consistency to match his acceleration and speed potential. I’ll be driving the car to the next event. Peter recommended the DTC-70 pad, but they’re a bit out of my price range, and I don’t want more front bias because I’m keeping the HPS pads in the rear. The car has to make a road trip to Missouri at the end of April, and I want a pad that will be up to the task of Buttonwillow and a 1,500 mile trip. I’m looking at HP+ or the Street Race pad. Understood and agreed with the amount of available power HP+ are less than ideal. However, given the desire to drive the car on the street without extra noisy and expensive pads they may be the better compromise. Here is where driver experience and skill can make up for the equipment deficiency and make it all work enough to have fun. Shorter slower tracks (like Adams, Grange or even Streets) won't be an issue. Big Willow and Buttonwillow all out with LS1 power will smoke those pads though. looks like car can go faster by losing some weight! I actually will be adding weight in the future. More sound deadening in the trunk area, and probably 2 8" subs, maybe even a half cage. I want to go fast but i also drive my car to the track and i gotta have music! Btw, how come you've never been out to Buttonwillow? Last edited by shaggyjake; 04-10-2018 at 10:55 AM..
haha I see. is it your daily as well? that is a really good lap time for a daily car! I'm not sure.. I ran into personal things twice before the bw event.. my best time there so far is 2:03 with stock e46 m3 running rs3. hopefully I can get into low 50's with 240 running TDs. pretty much. i wanted to keep it worthy of road trips and such. here's a video of my lap from Buttonwillow. if anyone has any inputs it'd be appreciated. i know i could lose a lot of time with some more experience. Ran across an old timing slip from November of 2009. Streets of Willow CW 1:32:818 - 1992 S13 hatch, gutted interior (guessing 2600 lbs. w/o driver), factory KA-24DE w/approximately 180,000 miles (maybe 130 whp), AEM "cold" air intake, HotShot header, Megan track series coilovers, 17"x8" 5Zigen FN-01rc with Nexen N9000 225/45/17 tires. Roughly 2:30 at VIR full. This video is from 2001 or so. Boltons, shocks/springs, might have had the JWT ECU. Around 1:30 at Roebling Road, also early 2000s, with the extra weight of a passenger. Boltons, shocks/springs, must have had the JWT ECU by this time because it doesn't look like I'm in the speed limiter halfway down the straight. Around 2:50 at Sebring, Intake/header/exhaust/cams/flywheel/ecu, shocks/springs, race tires of some sort. Updated! Impressive time with N9000 225! There is a small event tomorow @ adams motorsports park if anybody wants to come out! [QUOTE=battery1882;6274197]Updated! Impressive time with N9000 225! Full interior, weight was in the 2900s with driver. Suspension techniques springs, KYB AGX shocks, Toyo RA1 tires, stock brakes with track pads (mostly Hawk Blacks or Blues) and air ducts, no aero. With intake/header/exhaust/cams/ECU the car ran around 160 whp on dynos. Thank you! Let me know the tire size too when you have a chance! updated! congrats on shaving 1.5 sec! Yea, stoked about that. Thank you! No power added either. Changes were different dampers, new spring rates, brand new transmission, wider wheels, and different final drive. Oh and less sticky tires (RT615K vs RT615K+)! I see that you have MCS, what spring rates are you running? Yes! I'm on the 2 way remote reservoir setup. I think I shared my rates in my previous post. I'm at 600/500 now.